First weekend of May and lots of things going on. It's Star Wars day for some as it is "May the 4th". Tomorrow is Cinco de Mayo as well as National Scrapbooking Day. Today was to be the last day to upload your Journal Cover if you are interested in joining the E-Team Blog Hop next month. We've decided to extend the deadline and give you a couple more days. There are already some artful journal covers that have been shared. Please go to THIS POST to upload and share your journal cover. You have until Sunday, May 6th to upload your journal cover. I am very late to share and post my journal cover. I think part of it was procrastinating and not wanting to commit to ink it up. 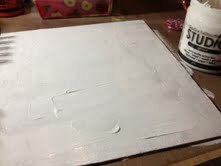 I started with covering the cover with some Gesso. Spreading it thick was my goal as I wanted to etch some words the cover. Taking a pencil, I wrote some words in a variety of handwriting as well as random scribbles. I really wanted to create some texture. To be safe, I let the covers dry overnight. 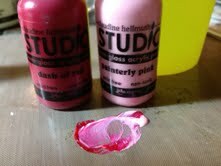 I wanted to use some of my Claudine Hellmuth Paint Studio stash. 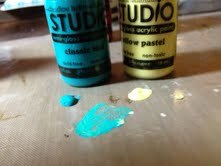 I love these smooth paints and how you can mix it up. I used this helpful chart to create up to 51 colors with just the 15 existing colors. 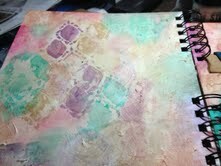 Using water to create a color wash, I started to apply the colors onto the cover of my journal. Using some Distress Ink (Vintage Photo) with a blending tool, I was able to tone down the colors a bit and highlight the etched words. 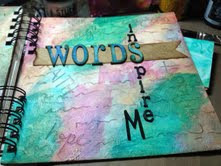 I decided that my journal cover is going to be a work in progress for this E-Team Blog Hop series. I'll probably add some embellishments along the way. I hope you find some time this weekend to get a little inky and create something for yourself. Thank you to everyone who have already shared their journal cover. You have two extra days if you decide to join in on the journal fun. 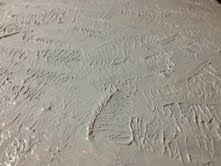 Fabulous texture with the gesso! And the "May the 4th" cracked me up.... have to share that with a few people. NICE. 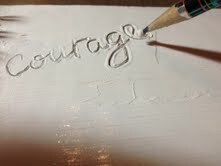 Love the idea of etching words into the gesso. And the colors are great. LOVE it.